When I’se in trouble, scare, or torment, I does but one thing, and that’s unresistable, unequalled, and durned-fast runnin. I just keeps at it till I gits comfort. REMEMBER WHEN Leave It to Beaver was cutting-edge TV and not a sociological anachronism on Nick at Night? When Fury was both a heartwarming TV show about a boy and his horse and an unreliable automobile with impossible fins and unpleasant color schemes? When kids played with toy guns at recess without being sent to the school psychologist? When schools didn’t even have psychologists? When fly fishers of modest means fished cane rods and the well-to-do experimented with something called fiberglass? If you, like me, remember all this, you’re old. By old I don’t mean really old. To be really old you’d have to remember when Spanky and Alfalfa starred in the Our Gang comedies in theaters and not in The Little Rascals on TV. You’d have to remember the Great Depression as a bottomless slough of despond and not as a historical bludgeon wielded against ungrateful children who wouldn’t finish their peas. You’d have to still think of the Internet and e-mail as passing fads and occasionally call your fluorocarbon leader material catgut. What I mean by old is more commonly called middle age, where you still have most of your original-equipment body parts and most still work, though not like they used to. I’m middle-aged, and so are most of my friends. I’ll go so far as to say that all my fishing friends are middle-aged. Not so long ago we dashed up and down riverbanks like mountain goats who had gotten into the Dumpster at Starbucks. Now we ooze along like conjoined banana slugs sack-racing in pricey plastic pants. We tell each other this is because we have learned with maturity to slow down and smell the rhododendrons, to cherish each moment and experience the here and now while we are still here and it is still now. But really we creep along riverbanks at gastropodic speeds because if we don’t our lungs wheeze and our pulses race and our hearts murmur and our knees crackle like campfires. Not to mention that realizing we have lived two-thirds of our allotted span has made us obsessed with conserving the remainder. Until we catch a good fish. Then we shed our middle-aged caution and hare off with the reckless invulnerability of teenagers. The scientifically inclined will say this is because our adrenal glands squirt our blood full of epinephrine, which boosts our strength, heartbeat, and blood pressure—the classic fight-or-flight mechanism our ancestors evolved to avoid overnight passages through a large carnivore’s duodenum. The unscientifically inclined will say this is because there is just no way we’re gonna lose that fish. A case in point: A year after his unsuccessful attempts to catch a landlocked salmon on Labrador’s Smallwood Reservoir, Cousin John flew out from Colorado for a week of landlocked-salmon fishing here in Maine, something we’d been meaning to do for a while and in meandering middle-aged fashion had finally gotten around to doing. As fishing trips go it was pleasant and varied, with lots of interesting backwoods country to see and lots of wildlife, good company, good food and laughter. The only thing the trip lacked was fish, a common problem hereabouts after eight years of drought, not to mention a withering spring heat wave abruptly ended by frigid rains, hurricane-force winds, and a hard freeze that killed tomato plants statewide two weeks past the USDA’s frost-free date. As my neighbor said of our year, by the third week of June we’d had sixteen weeks of March, three days of April, four hours of May, a week and a half of July, and two weeks of February. We fished hard most of the week without catching a good salmon, which my crowd defines as anything over eighteen inches, although we caught enough tiddlers in the foot-long range for John to get the idea what catching a good salmon would be like if we could find one to catch. Lots of theories floated around about why the fishing was so slow, the most plausible being that the drought had kept the fish from getting up over the falls from the deadwaters into the river after ice-out, and that the cold lashing rains and floods after the unprecedented spring heat wave and drought had, scientifically speaking, buggered the hatches. We fiddled around with techniques and locations, and spent a lot of time doing what my customary landlock cronies call “resting the pool,” which involves leaning back against a clump of birch and squinting at the run where fish ought to be rising but aren’t. All of which is very restful and pleasant and here-and-now, but I really wanted John to catch a good salmon to prove that good landlocked salmon (1) existed, and (2) could kick the mortal merde out of any trout that ever lived. So we took a day off from my usual river and headed over the ridge to my emergency backup river, which is smaller and has a more negotiable waterfall separating the overwintering salmon in the lake from the river and its springtime flushes of food and expectant anglers. This river, too, was high and cold and difficult to fish, but there’s one little back eddy I know about that always holds a good fish if any are in the river at all, and because it doesn’t really look like it would hold a fish, the fish it holds lie mostly unmolested. I stood on the bank and showed John where to stand and where to cast and just about where the fish would take if the fish was going to take at all, and I suggested a two-fly rig with a big stonefly for weighty advertising and a subtle little beadhead Pheasant Tail hung off its stern to close the deal. Then he shuffled carefully and somewhat painfully down the bank — over the winter one of his middle-aged body parts had tried to kill him, and he was halfway into a long recovery that had left him slightly frail, if anyone who fishes high-mountain creeks as much as he does could ever truly be considered frail, even by middle-aged standards. He sat down to rest alongside the inconspicuous little curl, lit a philosophical cigarette, rigged up, and watched the water with that concerned expression that in anglers means you’re onto a fish and in nonanglers means you’ve had a tangle of synapses come adrift inside your head, permanently swapping the names of your first reciprocated romantic attachment and the owl-faced algebra teacher with the hairy mole. Then he picked his way slowly into the heavy current, feeling for footholds among the greased-cannonshot boulders, planting his feet as the water built up a floating-rib-high bow wave broad-off his weather beam and left a long standing wave foaming in his lee. His first cast was just short of the right spot for a perfect drift, but he corrected beautifully on his next cast, the line point stopped right where the fish should be, he set the hook and his rod bent double, and John’s first-ever good landlocked salmon blasted head-high into the air, did a triple backflip into a double fin-loop, and then rocketed off toward the downstream rapids so fast you could hear his reel screaming I’m melllltinnnng right over the Montreal-bound train trundling over the trestle. What happened next is a bit more difficult to describe, although it’s easy enough to visualize if you’ve watched your share of Roadrunner cartoons. Picture a wizened Wile E. Coyote portrayed by the illicit offspring of Martin Luther and Gabby Hayes all dressed in waders and a bulging vest, a battered Filson hat screwed onto his head, and a nice cane rod held aloft like the Statue of Liberty’s torch. Picture him flying downriver with his legs a circular blur and a hydroplane’s rooster tail trailing in his wake, a sliver-plated and still-accelerating Roadrunner porpoising through the rapids fifty yards ahead going beep-beep, beep-beep. Of course it wasn’t quite like a Roadrunner cartoon. For one thing the fly rod came from Mike Clark and not Acme Rodbuilders. 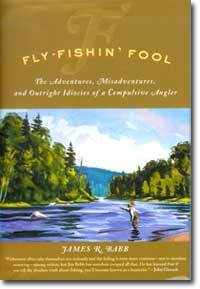 For another, there were no falling boulders, anvils, or safes; no train wrecks, cannons, or elaborate Rube Goldberg contraptions, unless you count John’s nylon leader and the double tungsten beads on his stonefly nymph. And, of course, landlocked salmon don’t actually go beep-beep, although they should. The real difference was that this time Overconfidentii vulgaris actually captured Disappearialis quickius. And then, after admiring his first-ever good landlocked salmon and noting somewhat ruefully that, thanks to reflexes geared for cautious trout and not gonzo tweakers like landlocked salmon, the little PT was embedded in a pectoral fin and not the jaw, John did what Wile E. would never have done after spending so much time running to earth a prime specimen of one of Maine’s flashing silver roadrunners: He edged into the current and let it go. After all, John’s first good salmon had nicely proven Points (1) and (2), and as a bonus had effected a miracle cure for middle-aged decline, with no known side effects other than a lingering feeling of youthful invulnerability.